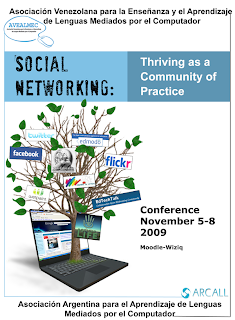 ARCALL and AVEALMEC are jointly organizing the Social Networking 2009 Conference, which will be a fully online event on November 5-8. If you would like to participate, you can get further details here. Edmodo - Edmodo is an all-in-one web 2.0 tool for educators. Features include a microblogging platform, privacy controls, file storage, file sharing, SMS notifications, an assignment calendar, and an online grade book. Engrade - This online classroom community provides an entire suite of tools for teachers to use inside and outside the classroom. Teachers can use Engrade to show students assignments, grades, attendance records, messages, and more. GeeVu - This free, web based utility makes it easy to bring your classroom into the digital age. You can use it to organize documents and present content to parents and students. RCampus - RCampus is a free education management system for teachers. It can be used to manage courses, online learning communities, and much more. OpenAcademic - Teachers can use OpenAcademic to create an Intranet, blogs, podcasts, a private workspace, or social networking environment. Palbee - Palbee is a free online communication service. Teachers can use it to conduct video meetings with students, parents, and colleagues. Yugma - This free web conferencing service allows users to share their computer screen and communicate with up to 20 people at a time. SpeakLike - SpeakLike makes it easy to communicate with people who speak other languages. This web-based translator can translate text in ten languages. Writewith - Writewith is an excellent web application for classroom writing projects. Students can upload documents, share writing space, and track edits. Quizlet - Quizlet is a paperless learning tool that can be used in almost any classroom. The tool allows you to create flashcards on any topic or study pre-made flashcards. FreeRice - Created by the United Nations World Food Program, FreeRice is an excellent web app for the English classroom. Students can practice their English vocabulary and help end world hunger at the same time. VerbaLearn - VerbaLearn is another wonderful study app for the English classroom. The site makes it easy to customize the way students learn English vocabulary and provides additional resources that would be useful to teachers. Edutagger - Edutagger is new social bookmarking service that works a lot like Delicious. The difference is that Edutagger was created for K-12 teachers and learners and includes only education-related content. Classroom 2.0 - This free social network for teachers is the perfect place to discover new web 2.0 applications and technologies. Members can chat with other educators and attend online events. Guest post from education writer Karen Schweitzer. Karen is the About.com Guide to Business School. She also writes for OnlineColleges.net, an online college resource.